Only the scriptures contain the inspired word of God. Everything said or written on these links except direct quotes of scripture are the mere words, opinions & teachings of man. We have not examined all these sites for truth, in fact we know that there are many false teachers and false doctrine included in some of there sites. These sites are linked so that our ministers and other ministers can learn to earnestly contend for the faith. After all, how can we ever fight false doctrine if we don't know what the false teachers are teaching? Example: In the "early church fathers" you can clearly see the seeds & germs of the beginning of catholic doctrine. Read these as history. 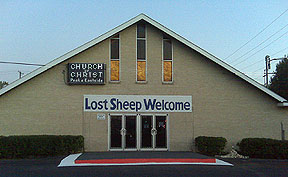 Find a Church of Christ anywhere in the United States. Visit our Sound Doctrine by Audio page, Written Lessons, and Gospel Preaching Sermons for hundreds of sermons in audio, video, and written form!